This page lists aggregated reviews of WP Remote from different sources if available as well as user reviews by other WPscoop visitors. If you have experience with WP Remote be sure to add your own review! Go here to find my main management plugin article and compare WP Remote with several alternatives to find out which one is best for your requirements and budget. Currently there are 2 reviews of WP Remote left by WPscoop users. If you have used this plugin be sure to add your own rating below! The easy way to implement and to use it. Theme /plugin Backup and update administration. Missing site restoration and duplication. WP remote works well and is completely free but it only has the basic management features. If installing updates is all you need this might be good for you but if you need backups, cloning or other advanced features better check one of the many alternatives. If you have experience with WP Remote yourself please leave your own review in order to help others choose the best management plugin for their needs. It will only take a minute! WP Remote is another hosted WP management service to control any number of WordPress blogs remotely. Having been completely free for a long time they launched a premium plan in 2013 which grants members access to additional features. According to the WPremote website over 50,000 WP blogs are currently being managed by all of its users. 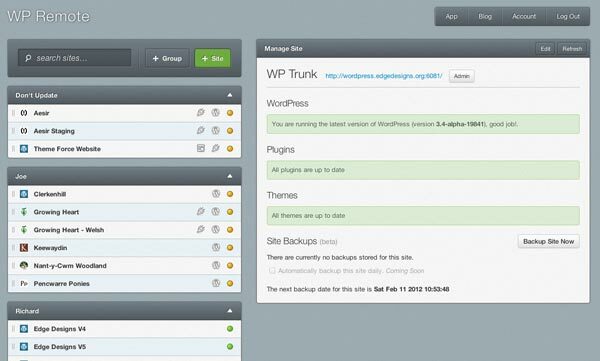 A look at the WP Remote dashboard from where you can manage all your WordPress blogs together. There is a core set of features that is part of all WP management services compared here: They all let you add all your website to a single account, update plugins and themes easily, quickly login to your sites and create backups. What is different is how they implement those basic features in their interface and how easy to use their management dashboard (pictured above for WP Remote) is. WP Remote concentrates on the core features mentioned above to help you manage multiple websites and does not have any unique features not found in its alternatives besides that. Easy to use and without much fluff WP Remote allows you to perform basic management tasks on your websites for free. Beyond that it lacks several features found in its competitors however and the new premium upgrade feels rather expensive considering that. Basic features of WP Remote can be used free of charge. A monthly subscription for access to their premium management features starts at $5 per website and gets cheaper if you subscribe for more than 1 site. WP Remote has a rating of 94% (out of 100) in the official WordPress plugin directory. In total there are 26 reviews for WP Remote. Go to WordPress.org to browse all the reviews. Please note that the reviews in the plugin directory are only for the free version of WP Remote and not for the pro version or any commercial addons. The free version has been downloaded 257570 times. With WP Remote you can use 8 out of 35 features that I track for WordPress management plugins in my comparison. Click the link to see a list of all available features. Please note that I only track features as reported by the developers in this review and comparison. I can make no judgement over how well the features listed below will work for you. I recommend you test WP Remote and some of its competitors yourself before deciding. See the table below for a quick overview of WP Remote prices as well as a comparison with average prices of management plugins. Please go to the main article to compare the price of WP Remote with other management plugins. I have also reviewed many competing products that allow you to manage multiple WP blogs. There are several worthy WP Remote alternatives you should consider before making your decision on which WP manager to use. Follow the links below to see my reviews of all alternatives to WP Remote. Follow the links below to compare the features of WP Remote to any of its competitors. Each of the WPscoop comparison articles takes a look at two popular solutions to bulk manage WordPress. Here is a small collection of reviews of WP Remote done by other websites that are worthwhile to read. If you have written a WP Remote review you would like to see featured here simply contact me and I will consider including it. What is your own experience with this plugin? Please share your opinion by posting a review of WP Remote with the form above!